Lulu waits for her Spot Farms Training treat. A tough trick to teach a dog is "leave it." But it's a good one to know, especially during the holidays when your dog might get into something they shouldn't. 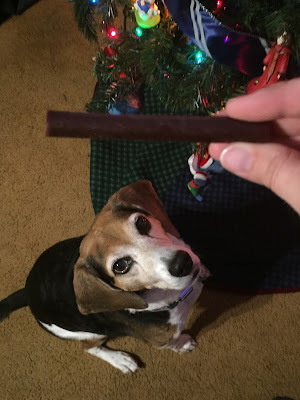 The easiest way to train "Leave it," how I was taught, is to put the dog in a sit-stay, place a treat some distance between you and the dog, put your hand between and say "Leave It." The dog will eventually avoid the treat. But there are a number of ways to do this trick. Here are some different methods you can follow. As always, know your dog before trying a trick, and talk to a trainer about any safety issues you may have. I used "Leave it" to take this picture, using Spot Farms Training Stix. Otherwise Lulu would be all over these treats. 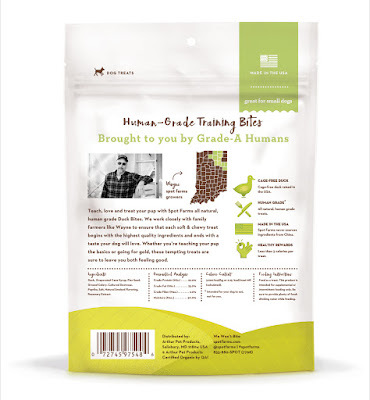 The back of a bag of Spot Farms Training Bites shows you they come from Indiana. Spot Farms uses local farmers for the meat for all their treats -- and you can see where the farmers are from right on the bag. The meat used is always human grade. 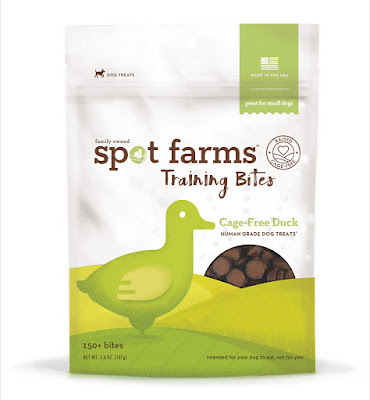 For these Training Stix and the Training Bites, Spot Farms also uses cage-free duck. Lulu waits for a piece of this Spot Farms Training Stix. The stix are soft an breakable, so you can break off pieces and hand them to the dog. The Training Bites are made from the Stix, they are just sliced into pieces. That makes them great for all dog sizes. Spot Farms Training Stix and Training Bites come in duck or chicken. They are currently available at Petco, and you can get some now! 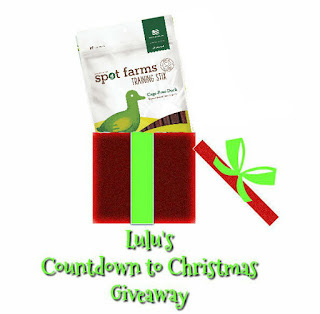 Enter to win some Spot Farms Training treats for your dog! Be sure to fill out the randomizer widget, and enter the two mandatory entries -- comment below on what you use to train your dog, and visit the Spot Farms website. The giveaway ends Dec. 21. Only US residents 18 years and old, sorry. Good luck! I've used various training treats over the years. I just adopted a 10-month-old Treeing Walker Coonhound pup and she really needs some training. I'd love to win these to use with her! I have used canine carryouts and pupperoni before for training my dogs. 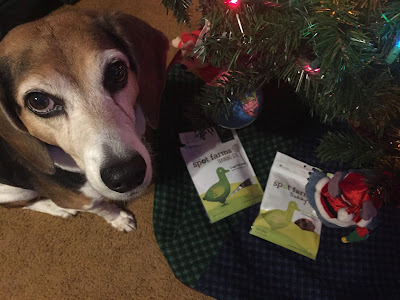 I use chicken or turkey snacks to train our dogs. We use liver snaps to train our dogs. To train my dog are use a variety of treats and positive reinforcement. string cheese works wonders with my dog! we train with little treats, liver bites, zuke's little bits, i like to watch their weight, so i dont use big pieces of treats. i break them up.